When you want a pizza in a hurry, but the pizzeria’s shut and the delivery service isn’t answering? 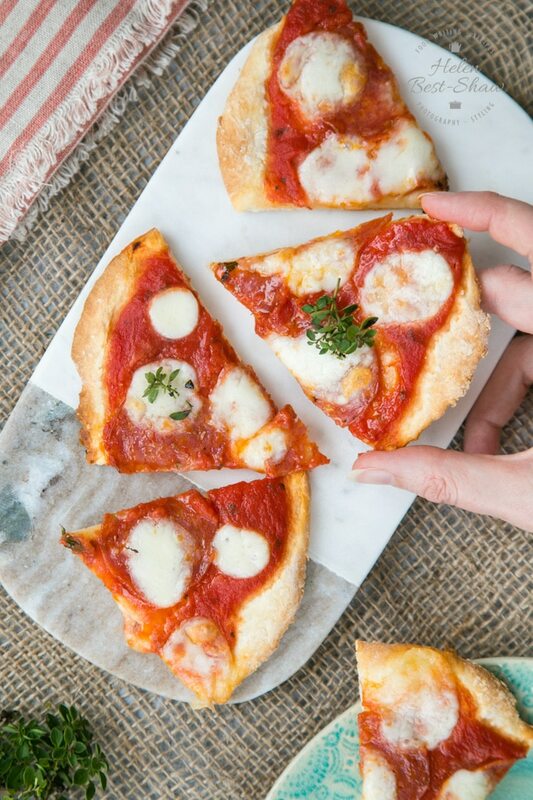 This no knead, no rise emergency no yeast pizza recipe will come to the rescue. It’s quick, easy, delicious and uses only 5 ingredients. You can prepare this pizza in less time than it takes your oven to heat up! Pizza in less time than it takes the oven to heat up! How does this no yeast pizza recipe work? I love pizza. Whether home made from slowly risen sourdough, delivered on the back of a moped or enjoyed at our excellent local pizzeria with a wood-fired oven, sometimes nothing will quite do in the way that a good pizza will. But there are times when I’m stuck, bereft and pizza-less. The restaurant is shut, as is the delivery service, and I haven’t prepared any dough. It’s at this time that I resort to this emergency pizza recipe. It’s for when I want pizza in a hurry, bu don’t fancy waiting for dough to rise. Rather, this recipe takes a few moments to bring together: no extensive kneading or long raising time required. 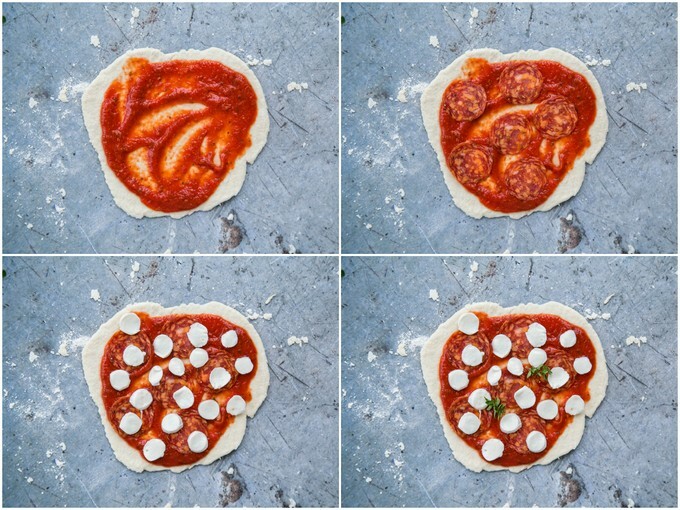 Simply mix, bring together and form the pizza base, add toppings, and bake. Thin, crispy, hot and delicious pizza. Done in less time than it takes the oven to warm up! Perfectly crispy pizza ready in a flash! Slow raised pizza dough made with bread yeast or sourdough starter is undoubtedly delicious, but the yeast does need a number of hours to rise. This recipe uses baking powder which starts reacting as soon as the liquid is added. The flat pizza base only needs to rise a little, so the dough is ready to bake as soon as it’s mixed. 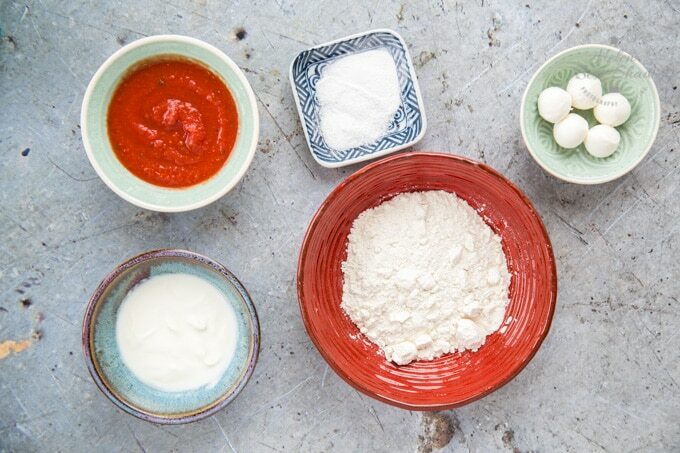 Step One – there are only six main ingredients needed to make a Margarita, two of which are the tomato sauce and cheese. The dough itself uses only flour, yoghurt, baking powder and salt. Switch on your oven to 220C/Gas 7/425F, and warm a baking tray or baking stone if you have one. 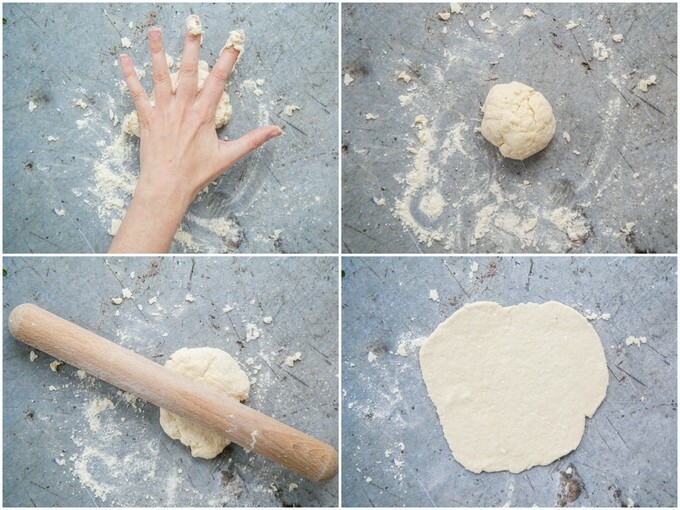 Step Two – start by making the dough. 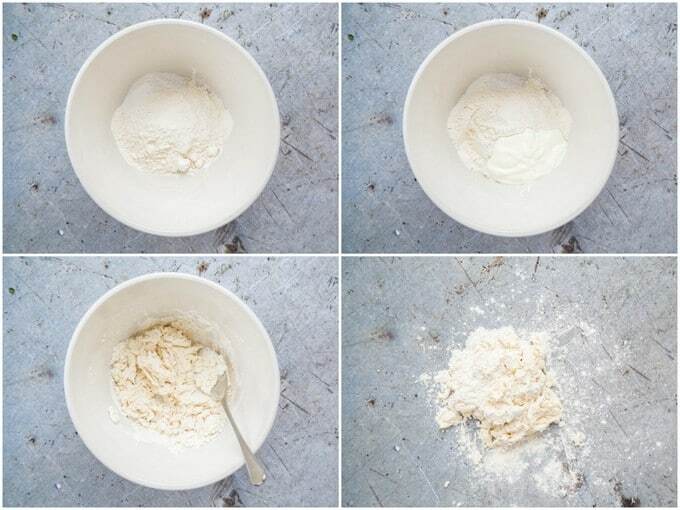 Mix the dry ingredients: flour, salt and baking powder together. Then add the yoghurt and mix to a rough dough. Tip this out onto the work surface. Step Three – knead the dough briefly to bring it all together. You don’t need a long, bread-making knead, but rather just enough to make a smooth dough – just roll it around for a minute. Roll the dough into a ball, then using a rolling pin (or wine bottle), roll it out into a circle. Don’t worry if your circle is a bit rustic. Step Four – top the pizza with tomato sauce, cheese and should you want to, any extra toppings. I’ve added some slices of pepperoni. If you want to drizzle the crust with some olive oil. Step Five – bake on the warmed stone or baking tray for about 8 minutes, until the edge is coloured. Serve and enjoy! Can I make Emergency Pizza using gluten free dough? Yes, but add some xanthan gum. For 75g of gluten free flour, add 1/2 tsp of xanthan gum. 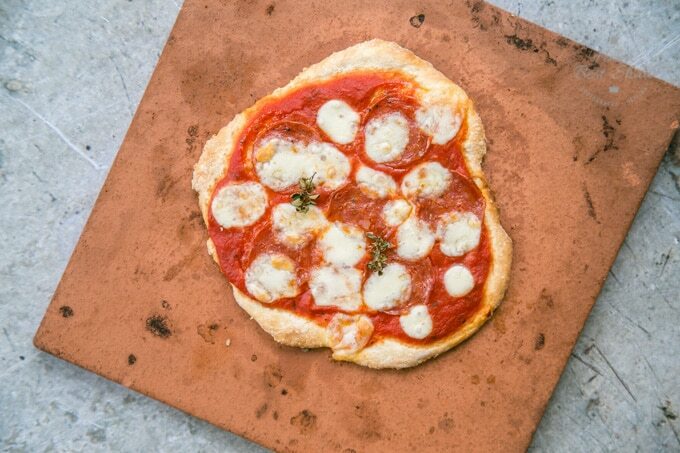 Also, it’s best to roll out the dough onto a silicone mat, top with tomato and cheese, and transfer the pizza on the mat to the oven. Depending on your gluten free flour, you might need to adjust the ratio of flour to yoghurt slightly. Can I make vegan emergency pizza? Yes! You can make this recipe using nut yoghurt – coconut, almond, or cashew. Obviously, choose an unsweetened and unflavoured vegan yoghurt. You might have to adjust the ratio of flour to yoghurt slightly and of course use vegan cheese. What tomato sauce can I use? There are all sorts of tomato sauce that work well on this pizza. 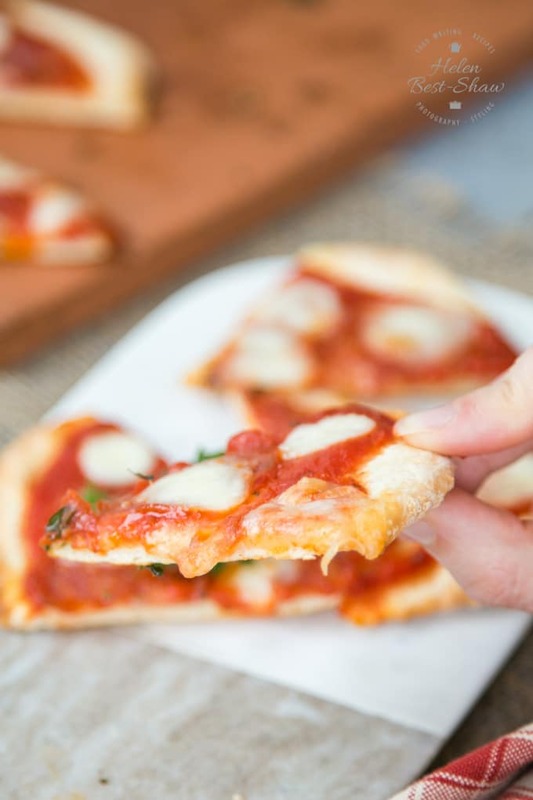 If you have it, tinned pizza sauce is perfect: simply freeze what you don’t use in an ice cube tray, then transfer the frozen cubes to a sealed plastic bag and store in the freezer. If you don’t have pizza sauce, you can blitz a tin of tomatoes to a smooth sauce and use that. Or when you have a moment, you can make some of my slow cooker tomato sauce and similarly keep it ready frozen into cubes. At a pinch, you can use tomato ketchup! Or leave the tomato off, drizzle with olive oil, garlic and herbs and make a pizza Bianca. Whatever you have! Mozzarella is obviously perfect, but if you only have cheddar, use cheddar! Use your imagination for the other toppings. We find pizza is far better cooked on a pre-heated pizza stone. When you cook on a hot stone the bottom of the pizza starts to cook before the stone even goes back in the oven. If you don’t have a stone then use the heaviest baking tray you have. Instead of a stone we have also used the cheapest terracotta floor tile from the discount tile shop when making this recipe – just give it a really good scrub and let it dry properly before you first use it. 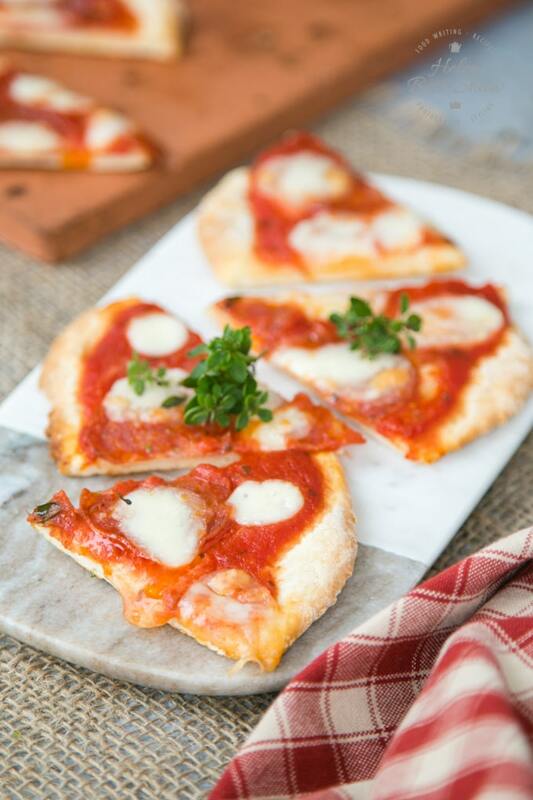 If you try this Easy Emergency No Yeast Pizza – No Rise, No Knead please tag #FussFreeFlavours on Instagram or Twitter. It is amazing for me when for me when you make one of my recipes and I really do love to see them. You can also share it on my Facebook page. Please pin this recipe to Pinterest too! Thanks for reading Fuss Free Flavours! 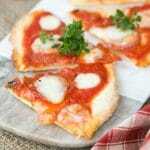 This emergency no yeast pizza recipe takes only a few minutes to make, but gives a thin and crispy instant pizza that'll really satisfy that pizza itch when you need it. Stick to a simple cheese and tomato sauce margherita, or add whatever you fancy or have in your fridge. Add the yoghurt and mix together. Tip out onto the worksurface, and knead briefly for a minute or so to bring the dough together. Roll the dough into a ball. Using a rolling pin, roll out into a 8"/20cm circle. It's ready for toppings. Heat the oven to 220C/Gas mark 9. Place a baking stone or tray in the oven to heat. Transfer to the heated baking stone or tray. Bake for 8-10 minutes, until the edges are coloured. What if I don't have any Greek yogurt? You can use regular yogurt, but might need to add some more flour to get a good consistency. Yes, but add some xanthan gum. For 75g of gluten free flour, add 1/2 tsp of xanthan gum. Also, it's best to roll out the dough onto a silicone mat, top with tomato and cheese, and transfer the pizza on the mat to the oven. Depending on your gluten free flour, you might need to adjust the ratio of flour to yoghurt slightly. Yes! You can make this recipe using nut yoghurt - coconut, almond, or cashew. Obviously, choose an unsweetened and unflavoured vegan yoghurt. You might have to adjust the ratio of flour to yoghurt slightly. There are all sorts of tomato sauce that work well on this pizza. If you have it, tinned pizza sauce is perfect: simply freeze what you don't use in an ice cube tray, then transfer the frozen cubes to a sealed plastic bag and store in the freezer. If you don't have pizza sauce, you can blitz a tin of tomatoes to a smooth sauce and use that. Or when you have a moment, you can make some of my slow cooker tomato sauce and similarly keep it ready frozen into cubes. At a pinch, you can use tomato ketchup! If you don't have a pizza stone then use the heaviest baking tray you have, or a cheap unglazed terracotta floor tile. This contains 17 WW points per portion.